Before President Trump left on his foreign tour, he addressed law enforcement and family members of the fallen at the 36th Annual National Peace Officers' Memorial Service outside the U.S. Capitol. In this speech he reaffirmed his campaign promises to restore justice and end attacks on police. "Every drop of blood spilled from our heroes in blue is a wound inflicted upon the whole country," Trump said. "And every heartache known by your families in law enforcement is a sorrow shared by the entire family of the American nation." As much as I agree with the president’s sentiments about the bravery and dedication of police officers, I cannot help but see through the hypocrisy and hollowness of these words. 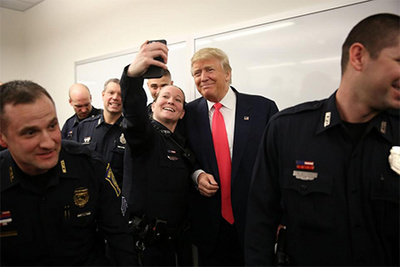 If the president really cared about police officers, then he would not defund public schools, cut social services, escalate the war on drugs, and loosen gun regulations. Taken together, these policies put police officers in immediate danger. Take for example the criminalization of nonviolent marijuana users. Studies show that legalizing marijuana would greatly reduce the burden of America’s prison system on taxpayers. The population in America’s jails and prisons has grown to 6.9 million, including those on probation and parole. A recent study showed that 60,000 individuals were behind bars for marijuana use. This cost taxpayers $1.2 billion. the war on drugs, as it is being waged under Trump’s new administration, takes resources away from the police and makes them less capable of responding to violent crimes. Most disconcerting is Trump’s reduction of investment in social services, which will have a devastating impact on police officers. Every weekday, millions of children from some of the poorest parts of the United States stay after school for programs that aim to bolster not only academic performance, but also social skills and relationships with caring adults. These kids get a safe and enriching place to spend the afternoon and early evening, and their working parents get child care. But now, these programs could go extinct, threatened by President Trump’s proposal to eliminate $1.2 billion in grants for after-school and summer programs. future earning potential, improving their performance at school, and reducing crime and welfare costs, according to a study by the Rose Institute at Claremont McKenna College. Other studies have shown that regular participation in after-school programs and community learning centers increases achievement in math and reading, school attendance, homework completion, class participation, improved classroom behavior and lower dropout rates. And 8 in 10 parents say after-school programs help them keep their jobs. Kids who do not have these programs turn to gangs. Kids who do not have these programs turn to drugs and petty crime. Kids who do not have these programs end up shooting police officers. The direct correlation is there, but the president refuses to make the connection. The same can be said for his administration’s stance on public education. The Trump budget would slash $9 billion—13 percent of the U.S. Department of Education’s funding—while investing $1.4 billion of new money in school choice, including private school vouchers. In addition to cutting supports to teachers and after-school programs, this budget eliminates funding for the Corporation for National and Community Service, or CNCS, which provides volunteer support and educational awards for teachers in training and out-of-school time programming. A majority of competitive grant awardees in the AmeriCorps program, the largest CNCS program, go to educational programs in schools and serve students in 41 states and Washington, D.C. Academy Charter Schools, Teacher Residencies, Reading Corps, Boys and Girls Clubs of America, and Teach For America could be eliminated under the president’s budget. Without these programs, police officers across the nation can expect to be dealing with youth who are less educated, less community oriented, less civically engaged, poorer, and much more apt to make violent choices. Lastly, there has long been a tension between the interests of law enforcement and the efforts to roll back gun regulations, but the conflicts will become more frequent as gun rights are expanded under the Trump administration. Police departments across the nation have insisted that gun owners be required to receive training, as their officers do, and that people with violent histories, who are more likely to clash with the police, be stopped from obtaining weapons. According to a New York Times article on the subject, Maine recently enacted a law allowing people to carry concealed weapons without a permit or training, despite the objections of Michael Sauschuck, the police chief in Portland, the state’s largest city. The bottom line is that there is a relationship between public education and crime; there is a link between the war on drugs and attacks on police; and there is a difference between truly supporting police officers and making speeches at memorials. If Donald Trump truly cared about the health and safety of police officers, his policies would reflect this concern. As usual, Trump is all bluster and no substance. George Cassidy Payne is a SUNY Adjunct Professor of Philosophy and Domestic Violence Case Manager in Rochester, NY. He writes frequently for a wide variety of local and national publications.